A massive outburst erupts from the giant black hole at the center of the distant galaxy NGC 660, which is 44 million light-years from Earth, in this via captured by ground-based telescopes. Image released Jan. 7, 2013. LONG BEACH, Calif. – Astronomers have discovered what appears to be colossal belch from a massive black hole at the heart of a distant galaxy. The outburst was 10 times as bright as the biggest star explosion, scientists say. The potential super-sized black hole burp find came as astronomers studied the galaxy NGC 660, which is located 44 million light-years away in the constellation Pisces. "The discovery was entirely serendipitous. Our observations were spread over a few years, and when we looked at them, we found that one galaxy had changed over that time from being placid and quiescent to undergone a hugely energetic outburst at the end," study researcher Robert Minchin of Arecibo Observatory in Puerto Rico said in a statement. To determine whether the outburst was from a supernova — the explosive end of a star — or the galaxy's core, the researchers used the High Sensitivity Array, a global network of telescopes that includes the Very Long Baseline Array, the Arecibo Telescope, the NSF's 100-meter Green Bank Telescope, and the 100-meter Effelsberg Radio Telescope in Germany. Instead of an expanding ring of material suggesting a supernova event, the researchers found five locations with bright radio emissions clustered around the galaxy's core. "The most likely explanation is that there are jets coming from the core, but they are precessing, or wobbling, and the hot spots we see are where the jets slammed into the material near the galaxy's nucleus," said Chris Salter, also of the Arecibo Observatory. 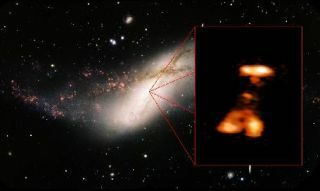 Those jets, the researchers said, would mean the outburst likely came from a supermassive black hole at the heart of galaxy NGC 660. As the black hole devours dust and mass, it pulls a whirling disk of matter into its heart that spews jets of particles as it is consumed. Supermassive black holes are colossal structures at the cores of galaxies that are between millions and billions of times as massive as the sun. They are much larger than stellar-mass black holes, which are created from the deaths of giant stars and can contain the mass of about 10 suns.